Since it was launched on March 10, 2000, I have been receiving many messages indicating that people have been enjoying the site. As of January 31, 2019, there have been a total of 412 visitors to the site whose comments (some of which were posted on Facebook) are recorded on these pages. We've recorded comments from 146 classmates who have taken the trouble to communicate their reactions, some several times. In addition, we recorded comments from 187 other OHS/OJHS alumni (p. 2) from classes ranging over 70 years from 1940 to 2009 plus 79 others (p. 3). It is heartwarming for me to know you are all enjoying the site, and it tells me that it has been well worth my efforts to build and maintain it. I thank you all for visiting and for your kind words, and I would like to share these words with all of you. So here is what our classmates and others have been saying about our class website. The most emotional reactions (my favorites) ─ those in which people tell me how the site made them feel ─ are highlighted. Editor's Note: Many comments are slightly edited, including some composites of comments received from the same person on separate occasions (which, therefore, may appear to lack continuity), but all are substantially the words of the commentators except for editorial comments that are italicized and set off in brackets. All commentators are asked to kindly accept our editorial changes. A young high school band director from upstate New York who is directing The King and I at his school. A former Associated Press sports writer. Lloyd Handwerker (a grandson of Nathan Handwerker, the founder of Nathan's Famous, producer/director of the acclaimed documentary film, Famous Nathan, and Gil Reavill, co-authors of the book by the same name. The daughter of our beloved late Coach Jan. The son of our beloved late Coach Roy Chernock. This IS my favorite page!! I did indeed smile at some of the memories of activities outside school hours such as the music and Nathan’s. ... Lastly, seeing the pictures of the old Nassau Hotel, Izzy’s Knishes, Fascination, and the full set of functioning concessions near Nassau Boulevard on the [Long Beach] boardwalk brought back a sense of nostalgia I long ago thought were gone from my memory. Thanks for the restoration of long ago memories. Adding Billy Crystal to the mix actually made me laugh out loud. ... Great fun. You have left me anticipating a better year. I tapped into the website and spent an absolutely wonderful, joy-filled, and, at times, sad (for those of us who died far too young) walk down memory lane all yesterday afternoon. You've done a spectacular job putting together the website for us alumni from the class of 1960 and certainly deserve a "hats off"!! I have tucked the website into my "favorites" and will re-visit it from time to time to see what's new. Thank you for your outstanding efforts. Although I was an Island Parker, I loved the photos of Oceanside and remember with fondness enjoying hot dogs and soft-shelled crab sandwiches at Nathan’s (sigh). My first job after school at age 15 was at Woolworth's in the strip shopping center on Long Beach Road, so, I was tickled to see that the mall still exists. And, who could forget the “Triangle” with the miniscule police booth, a place where I would seek refuge at night after a school activity while waiting for the bus to take me home to Island Park. Ah, the Little Red Store ... . And, oh, who could forget the Towne where we had such great times socializing and dancing. It was good, clean fun!!. My years at OHS were filled with fond memories, and, while some I knew thought I was nuts, I always felt sad at the end of the school year in June because I knew I wouldn't see a lot of my friends until school re-opened in September. When we graduated, I felt especially sad, knowing I probably would never see most of my fellow classmates again. You are absolutely correct when you say those were softer, gentler times. Surely, there were "bad" things happening then, as there have been since the dawn of man, but, somehow, things didn't seem so out-of-control and violent as they often do these days. Thanks again for enabling me to take a walk down memory lane ... . I can't begin to tell you how much I appreciate your work on our website. For me, it is an opportunity to get away from the daily pressure of work (stress) and focus on those things that are truly important in life, family and friends. Your efforts are truly magnificent!! Thanks for keeping me smiling. ... just revisited our website and wanted to let you know that I’m “pumped”! ... can’t believe how wonderful I feel after each visit. ... I can’t wait until Memorial Day Weekend 2005. My heartfelt thanks. As one of our classmates said, it was a terrific time we lived in and how different (and difficult) things are today for our young people. 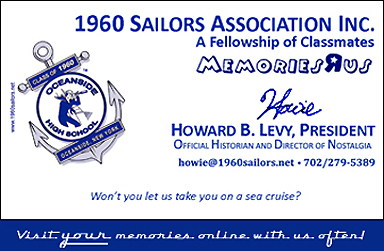 Thanks again, Howie, for reminding me how truly fortunate we all were to be growing up in the most wonderful of times! I can't tell you how impressed I am with the site, and I am so glad you went to all the trouble of creating it. ... I am overwhelmed with emotions. I have spent the last two hours alternating between tears and laughter. I can't get enough of it. Thank you so very much for helping to keep our class together ― the site is absolutely wonderful! Howie, my daughter was in the class of '81, and she was almost as taken with the website as I was. ... she spent 4 hours in there the morning I introduced her to it. I was very moved by the letter [from Nancy Keegan] about the terrorist attacks of September 11th, 2001. I passed the page along to a number of my e-mail friends and got some wonderful feedback about it. The majority of the people looked around the site and e-mailed me saying how well done it is and how much they enjoyed it. A young high school band director from upstate New York who was directing The King and I at his school. A former Associated Press sports writer, Bruce Lowitt.